A stufato is simply the Italian way to say stew. The version that appears below comes from my handwritten notes dating back about 40 years. Since writing a blog was the furthest thing from my mind then, I did not write down the author. Soooooooo, my apologies to the person(s) who came up with this delicious and easy peasy beef stew. For an old-fashioned Irish beef stew check this out. You could serve this warm and welcoming dish with some good chewy country bread, over rice, pasta or mashed potatoes, but I am serving it with a kasha pilaf. Kasha is roasted, whole grain buckwheat. And buckwheat is a great source of healthy fiber anti-oxidants and is rich in minerals. Best of all, it tastes great! While I am not in any way gluten-free, buckwheat is. I always make a lot because it is great as left-overs and stuffed in pita with chopped tomatoes and lettuce for a vegetarian or vegan lunch. I often find recipes with multiple parts and after I have made them, it turns out that I really only like the topping or the base but not what was in between. That’s how I came to make my Sriracha Cashews. So while beef stew definitely would not be appealing to a vegan, the buckwheat pilaf would. I have found inspiration in some unlikely places. I have successfully turned non-vegan recipes into vegan ones and clearly non-Kosher recipes into Kosher acceptable meals. So before you go dismissing a recipe, see if you can’t find some take-away that you can use. Heat EVOO in a heavy-duty saucepan with a cover. Add meat in a single layer, without crowding and brown on all sides. (I did this in batches. If you crowd the pan, the meat won’t brown.) Remove the meat to a dish while you prepare the rest of the stufato. Once the onion has softened, add the wine to just cover the meat (you don’t want to drown the meat – just barely cover it), tomatoes, garlic, and herbs and stir through to mix. Now add back your meat and any juices and give another stir. Add some cracked black pepper and stir once more. Bring to a boil. Then reduce the heat to a simmer, cover the pan and cook on low for 2 hours. Adjust your seasonings and discard the bay leaves before serving. In a 2-quart saucepan, heat the butter or oil and add the vegetables. Saute the vegetables until slightly softened. Add the hot broth (and salt, if adding) and bring to a boil. Add the kasha and stir through. Cover the pot, reduce the heat to a simmer and cook for about 12 minutes or until most of the water has been absorbed. Uncover the pot and fluff the pilaf with a fork before serving. I have been hesitant to add recipes like this to the blog because they seem so obvious to me and because I really don’t measure when I make them. However, I realized that what may appear obvious to me just may not be to someone else. This zucchini bake doesn’t have strange new combinations of ingredients or use sous vide techniques. It is simple to make, very flexible and the results are delicious almost no matter what you do. The fact is that the zucchini bake is just plain good. Zucchini bake goes beautifully with any grilled meat, poultry or fish. It could also be a main feature of a vegetarian meal. When my son was little, I always looked for new ways to get vegetables into him. Since most children – and adults – like pizza, I took the basic elements of a vegetarian pizza but changed the emphasis of the ingredients. Even though my son thought that he wasn’t a fan of zucchini, he always gobbled this up. Below are some basic guidelines for this easy and delicious side dish. However, feel free to add or change the cheeses or switch up the herbs to make it your own. You can also easily double or triple the ingredients to serve a crowd. 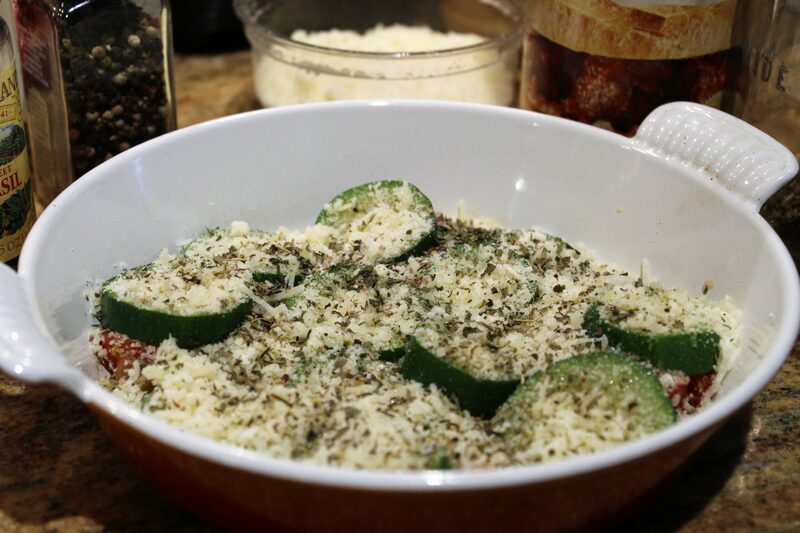 Use a heavy baking dish that is large enough to hold the zucchini when layered. (The shape of the dish is irrelevant.) Drizzle the bottom of the dish with EVOO. I like to use garlic-flavored EVOO but plain is fine if that is all you have. 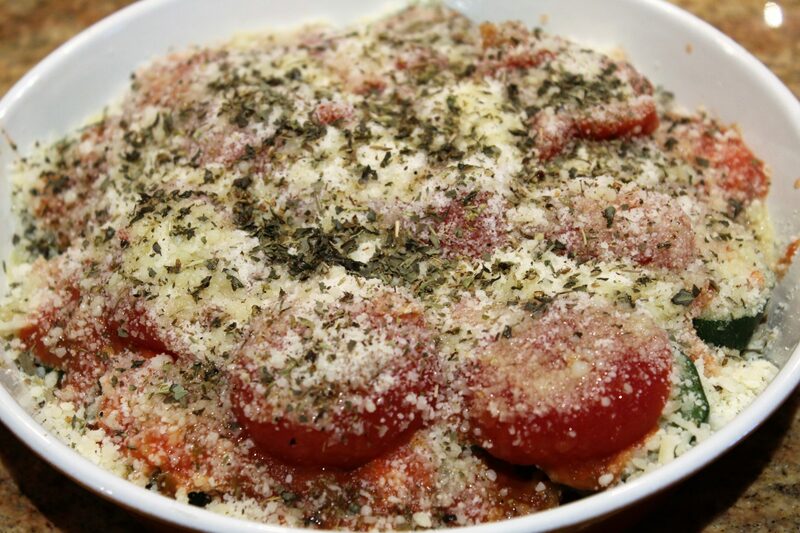 Place a layer of broken up stewed tomatoes on the bottom of the dish. Add a layer of zucchini. Sprinkle with cheese and bread crumbs. Crumble some of the basil and oregano over the bread crumbs, along with a sprinkling of salt and cracked pepper. (I never measure, but don’t be stingy with the herbs.) Drizzle a little EVOO on top and then repeat the layering until you have used everything up. I like to end with tomatoes. Bake uncovered for about 25 minutes or until the top is golden and the cheeses are melted. The zucchini bake can be made ahead and reheated. Dal is a cornerstone of Indian meals. They are wonderful with lamb and chicken or as part of a healthy vegetarian meal. And while I truly love Indian food, I have to be honest – it doesn’t make the most compelling photographs. Don’t be put off by that. The flavors in this dal are rich and smoky and yet mellow all at the same time. It’s very easy to make and if you get into South Asian or Middle eastern cooking, all of the ingredients will become staples in your kitchen as they are now in mine. Make the full amount since left-overs will not go uneaten. I highly recommend the cookbook linked below. It is full of step by step instructions and photos so that even a novice cook can make successful meals. Peel the potatoes and cut them into 1/2-inch dice. Place the potatoes in a bowl of cold water to prevent them from darkening. Place the split peas in a 4 quart saucepan. Add water to cover and rinse the peas, rubbing them gently between your fingers. Remove any debris that may be lurking (pebbles or the odd skin of the pea). Drain the peas and repeat until the water runs clear. Then add the peas to 4 cups of water in the saucepan. Bring to a boil over medium high heat. White foam should rise to the surface. Using a spoon, remove the foam and discard it. Drain the potatoes and add them to the peas along with the turmeric. Simmer the mixture, stirring occasionally for 20-25 minutes or until the peas are tender and the potatoes are cooked. In a small skillet, add the chilies, coriander and cumin and toast the spices over medium high heat, tossing them occasionally until the chilies are blackened and the coriander seeds are reddish in color. Everything will smell smoky and aromatic. Transfer the spice blend and the tomatoes into a blender and puree. Once the peas and potatoes are cooked (there will be liquid remaining in the pot), add every bit of the tomato and spice paste to the pot. Stir through. This can be made ahead to this point. Stir in the salt. Increase the heat to medium high and allow the dal to boil vigorously, uncovered, stirring occasionally. Cook for about 15 minutes to allow the flavors to mingle and the dal to thicken. You can use the back of a wooden spoon to smush some of the potatoes and yellow split peas for an even thicker sauce. Garnish with cilantro when serving. I have never met an eggplant that I didn’t like and frankly cannot understand when someone tells me they don’t eat eggplants. They can be prepared so many ways! And they are beautiful. So when I saw this recipe for Tian d’Aubergines in last week’s Chicago Tribune I had to try it. Tomatoes are at their most gorgeous now and I was able to pick up some luscious ripe ones at my local market. The only thing I changed from the original recipe was to add garlic because who makes eggplant without garlic?? I also layered my herbs and salt and pepper because – well, layering flavors is just better. This dish can be eaten hot, room temperature or cold. I am serving it at room temperature tonight with some lamb chops and a lovely rosé from Provence. I imagine that leftovers will be eaten with just some crusty bread to soak up all of the delicious liquid and a bright green salad. I did buy some Greek cheese the other day so I might have some sliced on the side. This is one of those wonderfully simple and versatile dishes like a good ratatouille. I was skeptical when I read that it baked for two hours, but the final result is deliciously unctuous so don’t skimp on the baking time. Heat oven to 350 degrees F. Lightly drizzle oil on the bottom of a heavy rectangular baking dish (mine was 9.5 by 13) large enough to hold everything very snugly (there will be some shrinkage when it bakes). Place the baking dish on a pan since there might be a little spillage when it bakes. Layer the onions and garlic over the bottom of the pan and sprinkle with lots of fresh thyme leaves, a sprinkling of salt and some pepper. Cut off both ends of the eggplants and then slice almost all of the way through but not entirely at 1/2 inch intervals. Slice your tomatoes and nestle one slice between the cuts in the eggplant. Place the stuffed eggplants in the baking pan over the onion and garlic. Don’t worry if you have to squish things a little to force them in. They will bake down. Sprinkle with more thyme, salt and pepper. In a small bowl, make the vinaigrette. Mix well and drizzle it over the eggplant. Drizzle a little more EVOO and sprinkle a little more salt. Bake uncovered for 1 hour. Then cover and bake for another hour until the eggplant is cooked through, the house smells amazing and the liquid is bubbling up in the baking dish. Serve at any temperature that you choose. My birthday was Saturday and my wonderful son and daughter-in-law sent me the perfect gift – a cookbook by Madhur Jaffrey, amazing spices and a gift certificate for cooking lessons of my choice at a local school. I adore Indian food so I immediatelyt started reading Jaffrey’s book over my morning coffee. Some women get seduced by a new pair of shoes. My downfall is cooking ingredients and gadgets. We have some wonderful Indian/Pakistani stores in Chicago and I have things in my pantry that caught my eye, but somehow never got used. I came across Jaffrey’s recipe for Moong Dal and since I never met a lentil that I didn’t like, I kept reading. While, it’s true that the average American cook doesn’t just happen to have moong dal and asafetida in the pantry, I actually do. I’m sure that I bought both after reading some recipe and then never got around to making it. Well, I am making it now! Jaffrey serves it with Basmati rice, which I always have on hand and she mentions Lemony Ground Lamb with Mint and Cilantro. Coincidentally, I have all of those ingredients and so am planning a mini-feast. It’s only a shame that Frances and Matthew aren’t here to share it with us since I know that they would enjoy this meal as well. Andrew and I are looking forward to many happy meals thanks to our children! Of course, if you are a vegetarian or a vegan, the Moong Dal and Rice together are a wonderful meal, perhaps with another vegetable dish added. This is real comfort food. Put the dal in a medium pot and add 3.5 cups of water. Bring to a boil and skim off any froth. Add the turmeric, stir to mix and partially cover the pot. Turn the heat to a gentle simmer and cook for 45 minutes. Add the salt and stir through. Turn off the heat. Pour the oil into a small, heavy frying pana nd set over medium heat-high heat. When the pan is hot, add the asfafetida, cumin seeds and chilies, quickly and in that order. As soon as the chilies darken (a matter of seconds), add the shallots. Stir and cook until the shallots brown and then quickly pour the contents over the cooked dal. Stir to mix and serve with the rice. Pour the oil into a large, heavy-duty frying pan (I like cast iron) and set over medium high heat. When hot, put in the cinnamon sticks. Allow them to sizzle for a few seconds, until fragrant. Add the onions. Stir and fry the onions until the edges turn brown. Add the lamb and ginger, breaking up the lamb with a wooden spoon. Stir and fry for about 5 minutes. Add 3/4 cup of water, the salt and cayenne. Stir and bring to a simmer. Cover the pan, turn the heat to low and simmer gently for about 40 minutes. Add the lemon juice and garam masala. The dish can be made ahead of time up to this point. When ready to serve, bring the mixture to a simmer and add the mint and cilantro, stirring through. Heat uncovered for about 5 minutes. Serve with Basmati rice and the Moong Dal, Naan and any chutney of your choice. This can be wrapped in the flatbread and eaten as a wrap, with some chopped fresh tomatoes. Oftentimes at work, we have vendors come through telling us about their amazing products, from flavored vodka to pistachios. The flavored vodka vendors brought a manicurist, a masseuse, a bunch of Pottery barn soft, fuzzy robes that redefine “fuzzy robe” because they are so soft, and well, flavored vodka. More directly relevant were the Pistachio folks who came through, and set up a veritable feast with every dish including pistachios. It was basically a pistachio party, and my favorite takeaway was the inspiration for this butternut squash and farro salad. I love making grain salads that incorporate random tidbits from my kitchen, and when the grain salad incorporates free bags of pistachios, even better. This was so good that it could have been a meal in and of itself. Cook the farro according to package instructions. (Usually just put the farro in a pot with enough water to cover it, bring it to a boil and then reduce heat to medium-low and simmer until the farro is tender about 30 minutes). Heat the oven to 400 degrees. Take out a baking sheet, line with foil and drizzle some EVOO. Put cut up butternut squash on the pan, sprinkle all the spices on the butternut squash then stick in the oven until the squash is tender, about 35 minutes. Drain and transfer the farro to a large mixing bowl, and add the butternut squash, EVOO, pomegranate seeds, arugula, and pistachios. Serve with a dollop of goat cheese, good both warm and at room temperature. One of our favorite “date night at home” menus includes a cast iron steak cooked to crispness on a cast iron skillet plus some roasted vegetables. The struggle has been trying to find inventive sides to go with the steak just for some variety. Lately I’ve been really into these colored carrots that seem to taste better than the average Bugs Bunny carrot, really only because I’m easily distracted and impressed by colorful food on my plate! This recipe would be a lovely side course to serve at a dinner party, as well, as it would plate beautifully and be a creative way to jazz up the side potatoes routine. Slice the head of garlic in half widthwise and toss in oil just to coat. Wrap in foil. Bake for 45 minutes to 1 hour and then mash into a paste. Slice the shallot into paper thin rings and toss in a bowl with some lemon juice to coat. Allow to sit for 30 minutes. Preheat the broiler. Peel the carrots and trim the tops and ends. Cook the carrots in the boiling water until they are just shy of fork tender. Remove the carrots and lay on a baking sheet. Toss them with oil. Place the baking sheet under the broker until the carrots are slightly blistered. Put the yogurt in a small mixing bowl. Stir in the harissa until you get your desired spice level. Do the same with the roasted garlic paste. Then add the lemon juice and salt to taste. To serve, spoon some of the yogurt on each plate, put carrots on top, and finish with the sunflower seeds, pistachios, the shallot, parsley and mint.